President Larry Roberts called the meeting to order at 6:31 p.m. Directors present for the meeting were Doug Alred, Jane Alred, Christy Astorga, Bonnie Brooks, Errol Daniels, Susan Haag, Dennis Harrison, Stan Lambert, Franz Lerch, Ty Payne, Larry Roberts, Larry Sassa, Paul Smith, Lamar Strother, Douglas Tillett, Stuart Toomey and Jim Van Cleave. Directors Angela Harris and Todd O’Donnell were absent. Approval of 8/7/18 (August meeting) minutes: On a motion by Lamar Strother and seconded by Stuart Toomey, the August board meeting minutes were approved as submitted. Treasurer’s Report: Bonnie Brooks distributed copies of the Balance Sheet and the Profit and Loss Detail Statement through August of 2018. Lines items discussed and paid included RRCA reimbursements, Fletcher High School track meet and Epitome of Excellence Classic payments, TDP race team entries, and various Cecil Field XC expenses. Within the financial package was the budget, which was to be discussed during the Finance Committee report. Also, board members were asked to report volunteer hours for the tax year. Master Trails Plan – Larry Roberts reported that the trail steering committee had their fourth meeting last week, in which progress has been made. The name for the trail has been selected and will be called Emerald Trail. As plans continue to develop, the city council will sign off on the implementation schedule in October. Cross Country Trail Markers in city parks – It was previously discussed in our last meeting to perhaps develop standard mile markers to be used in the city parks. From this discussion a trail recon meeting has been scheduled. Larry reported that this meeting would be tomorrow, Wednesday, September 5th, in which he will be walking the trails with Colin Moore of Jacksonville City and Parks. Larry invited members of the board to participate if they were available. 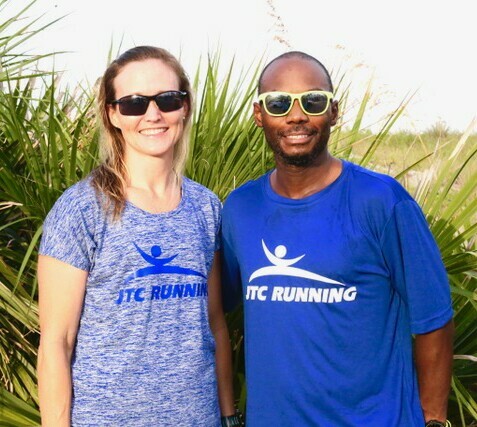 Where to Run in Jacksonville on JTCRunning.com – Larry reported that Paul Smith would be taking the lead on this committee project to develop the tool/database of where to run in Jacksonville, as suggestions and ideas should be sent to him. Paul and other members stated that there are various existing apps and websites with similar information that we should use as our model, since it will be easier to use existing tools rather than creating one from scratch. Again, the goal is to include in-depth details of group runs, routes, and races in Jacksonville. From the discussion an ad hoc committee was formed to gather information and work on this. Fall Half Marathon Training Class Kickoff – Our fall half marathon training class kickoff will be tomorrow, Wednesday, September 5th, at the 1st Place Sports San Marco store. Registration is still available, as we currently have 64 entries signed up. Board members are encouraged to attend to volunteer and welcome new and existing members. Open Floor Discussion – Since there was not any new business to discuss, the floor was opened for open dialogue. Doug Alred stated that voting for the Gate River Run t-shirt design was still open but would be ending soon. Larry mentioned that information and registration for the Gate Training class would be available soon. Doug then confirmed that race registration for Gate opens in October which is usually started with an email blast. It was reiterated that it was time to focus on sponsorship and city involvement in terms of the importance of the race. From this discussion a need for a River Run committee was determined. Tijuana Flats Summer Beach Run and Kickoff (8/25/18 and 8/6/2018) – Doug Alred reported that the race had good weather and with an earlier start there was no worry about low tide. There was plenty of volunteer help from the local schools. Entries were down from the previous year, as we had 1,333 runners versus 1,664 runners from last year. The race was still a success as we were able to cut costs in some areas, like using old River Run shirts. Doug said he would provide the final numbers and results at next month’s meeting. Guana Trail Races (Sun 12/2/18) – Registration is currently open on the website and planning is ahead of schedule. This year there will be race shirts provided and the race has designated as the USATF 50K State Championship. We can reach out to Mark Ryan, who is currently the president-elect of The Guana Club. Mike Lynch requested race entries on behalf of the Police Fire Rescue Department. Last Gasp (TBD) – Herb Taskett, race director, spoke with JU regarding locking down the race date for 2pm Saturday, December 29th. Race Committee / Track Meet Committee – No Report. Classes & Clinics – Jane reported that she was currently in the process of planning some nutritional seminars and sessions with Kelsey Beckman, who is a registered dietitian and avid runner, however nothing was concrete at the moment. She stated it was time to start planning the holiday social, which will be held at the 1st Place Sports San Marco store after The Festival of Lights race on 12/8/18. Community & Public Relations – As mentioned last meeting, we need to be more proactive in selling and advertising Gate River Run. It was discussed that we should consider how far we have come and where we see the race is going. Ideas to get the city of Jacksonville involved and more involvement from city officials was discussed. Larry Sassa mentioned that we should develop a brochure and presentation in hopes of presenting to city officials and others. Other avenues include getting a proclamation made regarding GRR. Another suggestion was to create a video montage of the River Run’s value, importance, and impact to the running community and the city, while utilizing Lamar Strother as our River Run historian. Again, the purpose is to position ourselves and our races in a favorable light with the city as we continue to move forward. Finance – Bonnie Brooks mentioned that she needed the volunteer hours of each board member for September 2017-August 2018. Bonnie went over the funds requests that had been submitted. A proposal request from Sandalwood High School for $500 for the Florida District I Meet, which is scheduled for October 27th with a reach of 120+ people, was presented. Bonnie presented a motion which was seconded by Franz Lerch to award Sandalwood High School $500 as requested was passed by the board. Next Bonnie detailed the 2018 budget, budget vs. actual figures. Membership – Stuart Toomey reported that membership was currently at 1,188 active members. Merchandise LogoXpress – Christy Astorga reported that the updated products and merchandise are available through LogoXpress and can be purchased on JTCRunning.com. Communications: Newsletter, Social Media – The cutoff to submit an article or material for the next newsletter is the 10th, however if more time is needed it would need to be in by the 15th at the latest. It was suggested that we make sure to include information for our new merchandise in the newsletter, since we have started advertising it on our website and social media channels. Stan Lambert suggested that members who use Twitter should follow Clayton Freeman as he includes news and information as it pertains to local Jacksonville sports. Vision & Planning – Doug reported that Tomahawk Park will need more renovations and improvements, but at this time no additional funding requests for park maintenance were needed. NEXT MEETING – The next board meeting will be Tuesday, October 2, at 6:30 pm in the Mediterrania Restaurant. The September meeting was adjourned at 7:39 pm. JTC Running Merchandise Now Online! Thanks for visiting our website. If you have any tips or suggestions, we would love to hear from you.